British Airways has officially unveiled its new economy (World Traveller) and premium economy (World Traveller Plus) product today, on its new B777-300ER aircraft. BA’s remaining B777-200 fleet and its B747 fleet will not be retrofitted, but instead will be “refreshed”. The flight taking place today to Mumbai (BA139) has BA Chief Executive Willie Walsh on board, and a full report will be published on businesstraveller.com tomorrow (Saturday September 4). BA’s new economy product is still in a 3-3-3 configuration (ie: 9-across in each row, ABC – DEF – HJK), good news in these straitened times with so many airlines introducing 10-across seating on the B777 aircraft. To view more images of the new World Traveller seating, click here. BA’s new premium economy product has six rows with a 2-4-2 configuration offering up to 44 seats on the new B777-300ER. For a seatplan, click here. The seats have a 38ins seat pitch, a new “hammock style” and fully adjustable headrest and footrest. There are also new upgraded soft furnishings which include new pillows featuring a heritage design, fleece blankets and amenity kits. Other services include complimentary newspapers, a hot towel service and increased baggage allowance on selected routes. The seat back video screens are 60 per cent larger than the existing premium economy screens (10.6 inches) and all WTP seats have individual in-seat power with a socket compatible with UK, US and European plugs, and two USB ports and a RCA port to allow customers to use their electronic devices with the IFE system. To view more images of the new World Traveller Plus images, click here. 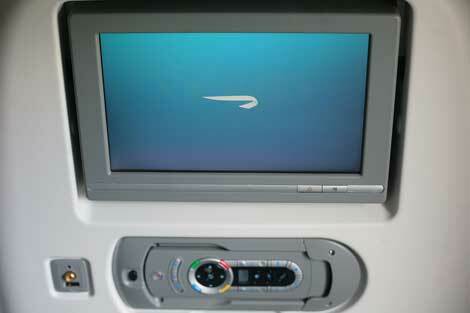 The new Thales IFE system across all cabins features more than 230 TV programmes, 70 films and 400 CDs. 50 per cent more choice on movies and doubling the range of TV and music options, plus plug and play technology.– providing customers with, as well as up to 60 per cent bigger high-resolution screens. The IFE handset allows passengers to play games against other customers onboard and also a socket allows power electronic devices with access to a personal in-seat power socket compatible with UK, US and European plugs. The aircraft seats 297 passengers, with 14 in First, 56 in Club World, 44 in World Traveller Plus and 183 in World Traveller. BA is the first UK airline to fly the B777-300ER. It has ordered six Boeing 777-300ER’s, with three going into service before the end of 2010 and the remainder by early 2012. The second goes into service on October 1. In typical British Airways configuration, the GE powered B777-200 has a range of 5,400 nautical miles with a full passenger load, compared to the 777-300ER which will carry over 30% more passengers 7,600 nautical miles. The B777-300ER is powered by two General Electric GE90-115BL engines, the world’s largest and most powerful commercial jet engine, producing 115,300 pounds of thrust.